The vast majority of octa-core Android TV Boxes sold on the market comes with 2GB RAM, but Amlogic S912 based R-Box Pro TV box was interesting with its 3GB RAM option (aka R-Box Pro 3G), as I wondered if I would see any noticeable improvements during my tests with the extra RAM. We’ve already confirmed the the hardware comes with 3GB RAM using 2x 1GB + 2x 512MB RAM chips configuration in the first part of the review last month, and it’s now time to check out whether this translates to anything in Android, as well as go through the usual hard-to-get features to work like automatic frame rate switching and HD audio pass-through. One positive with the device is the four USB ports, so this time I did not need an USB hub at all, and connected a USB HDD, two RF dongles for an air mouse and gamepad, as well as a USB keyboard to take screenshots. I completed the hardware setup with Ethernet and HDMI cables, and plugged the power supply to boot the device. Boot time is rather slow compared to competitors at about one minute. 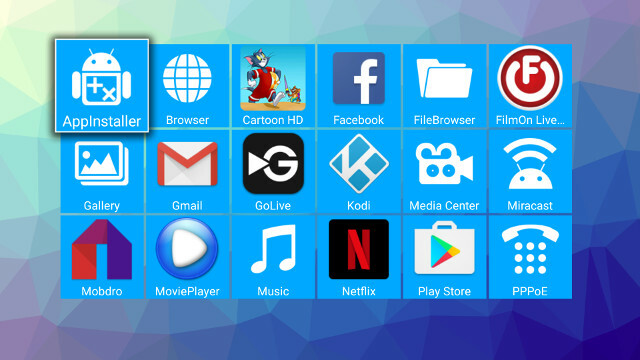 The launcher used is exactly the same as on Rikomagic MK22, and the list of apps is also quite similar with IPTV apps such as Mobdro, Netflix, FilmOn Live, and UkTVNow. 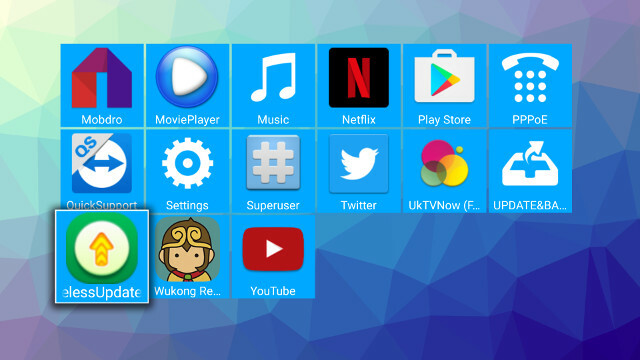 The setup is also exactly the same, so if you want to find out more about the interface and setup options you can read Rikomagic MK22 review, while you’ll find more details about the IPTV apps (Mobdro / Filmon) in MXQ Plus / M12N TV box review. I had no troubles with the settings when configuring WiFi and Ethernet, and the system kept the video output resolution I set (3840x2160p60) even between reboot. Part of the 16GB flash is used for the operating system, and the user still get 11.38 GB to play with, and at the end of the review after installing apps and some copying files, I only had used 3.26 GB. 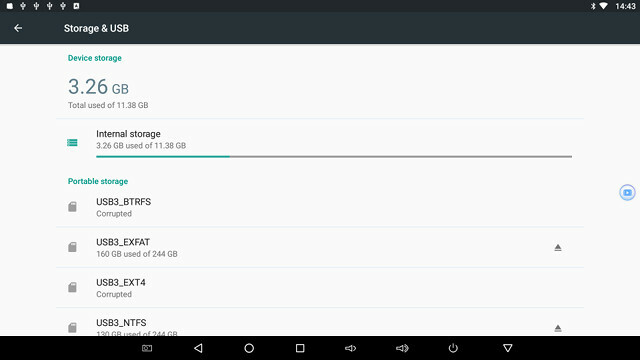 You can also see exFAT and NTFS file systems are supported as usual, and a FAT32 micro SD card could also be mounted. 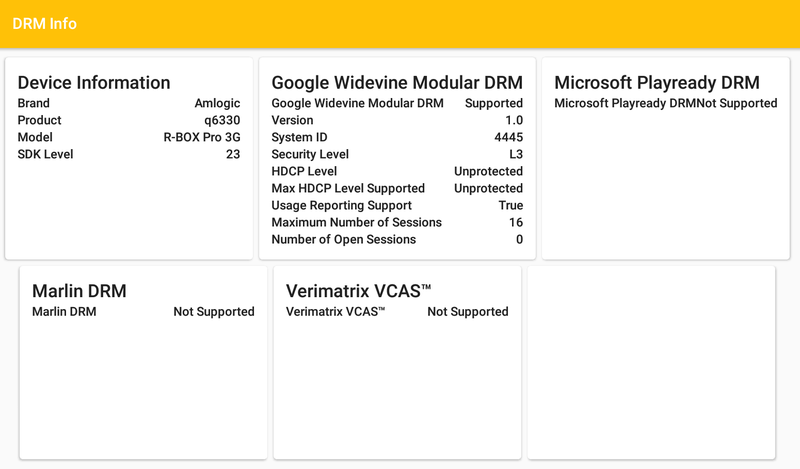 The “About Media” box section shows R-BOX Pro 3G runs Android 6.0.1 with Linux 3.14.29, no surprise here. The firmware is rooted. 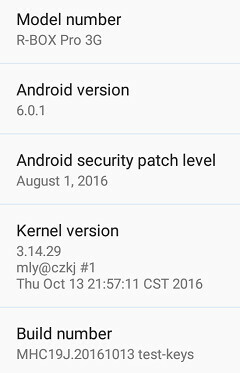 I received the box early October, and when I first boot up the device the firmware was dated in September, so I checked for firmware update. They’ve done something pretty stupid as they’ve included both UPDATE&BACKUP and WirelessUpdate apps in the firmware, which is sure to confuse customers. But basically UPDATE&BACKUP app is not configured and trying to get an OTA firmware update will results in “Check Failed! Check Your OTA Servier Argent” (sic), while WirelessUpdate app appears to be configured, but can’t get any update firmware from the server, probably because they did not bother to copy any firmware… Finally, I could find new firmware on GeekBuying, but again on for “USB Burning Tool” with IMG extension, so I decided to try some new SD card method with Amlogic IMG firmware in Linux and Windows, and I finally managed to flash the firmware without using Amlogic USB Burning Tool. It took me nearly a full Saturday to make it work, but at least now I know how to do. I had no problems using both Google Play and Amazon Underground to install apps. The remote control worked well enough up to 8 meters, and I could turn on and off the box with it. The case top and bottom temperatures were respectively 41 and 51 °C max after Antutu 6.x benchmark, and after 15 minutes playing Riptide GP2, they rose to 42°C and 60°C respectively. The game performance was constant over time, and about the same as on other Amlogic S912 with highest resolution settings, i.e. not perfect, but playable. Since one of the first thing I do with a new box is to check for new firmware, not having OTA firmware update, nor a simple SD card or USB flash drive ZIP firmware is not a good way to start. Sadly, even after the frustration of flash a new firmware, I had sluggishness issues with some apps show the “App is not responsive window” aking to wait or kill the app a bit more often than I’m comfortable with, and as we’ll see below my Kodi experience was one of the worse with 4K videos and audio pass-through. I certainly did not feel any benefit of having 3GB RAM over 2GB RAM with this device, as I was hoping the extra read/write buffer for the storage might improve the performance, but the opposite happened, likely because of sub-optimized firmware. Most people probably don’t have VP9 videos, but considering one of the key selling on Amlogic S912 over Amlogic S905 is hardware video decoding support for VP9, it’s quite an unexpected issue, especially it is working on other Amlogic S912 TV boxes I tested so far. The box supports Widevine Security Level 3 DRM, which should allow for SD playback of some premium video services, but not HD or UHD. I’ve copied a 278 MB file between the internal storage and a SAMBA server using ES File Explorer in both direction in order to estimate WiFi performance. R-Box Pro support 802.11n and 802.11ac WiFi, so I tested both on different routers, and the system achieved 1.4 MB/s throughput using 802.11n, and 2.0 MB/s for 802.11ac on average. 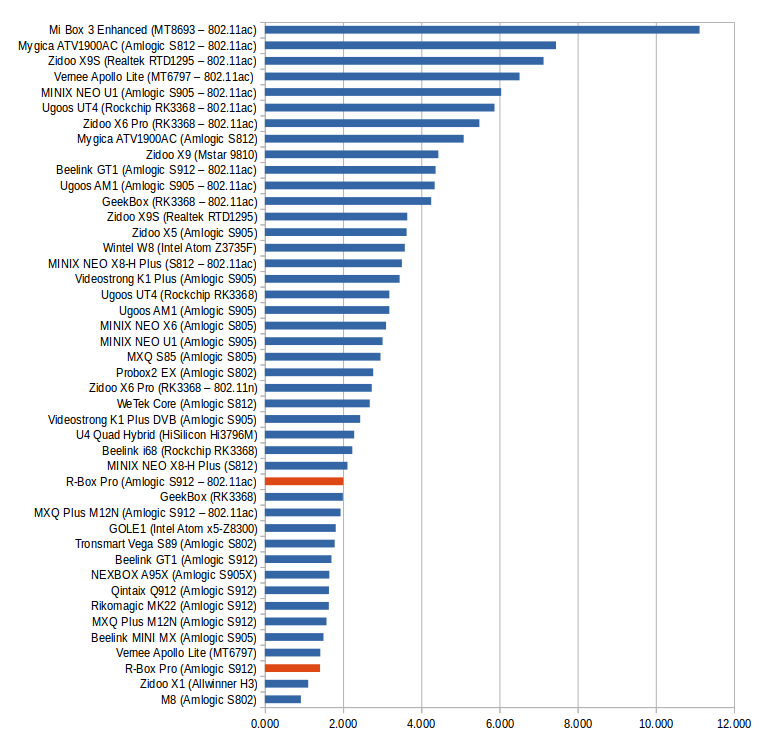 The chart makes is clear that neither 802.11n nor 802.11ac performance is very. I must note than in the case of 802.11ac download performance was much higher than upload performance averaging about 3.4 MB/s. 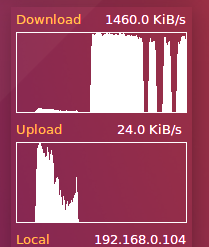 The chart on the right shows both Download (Upload from TV box – top) and Upload (Download from TV box – bottom) shows the traffic shape for 802.11ac transfer. 802.11ac download shows the performance is not stable, but at least there are no stalls, but the upload shows mostly constant throughput with several 3 stalls during transfer, so the connection does not appear to be entirely stable. I measure Internal storage performance with A1SD bench, and the eMMC flash used in R-Box Pro delivered 39.28 MB/s read speed, and 19.31 MB/s write speed. Not the best, but those values should be enough to have responsive firmware in most conditions. So the slow loading apps issue if most probably due to a firmware/software issue then a problem with the hardware itself. The board name is q6330, exactly the same as Rikomagic MK22, so I’d expect the firmware between those models to be very similar. 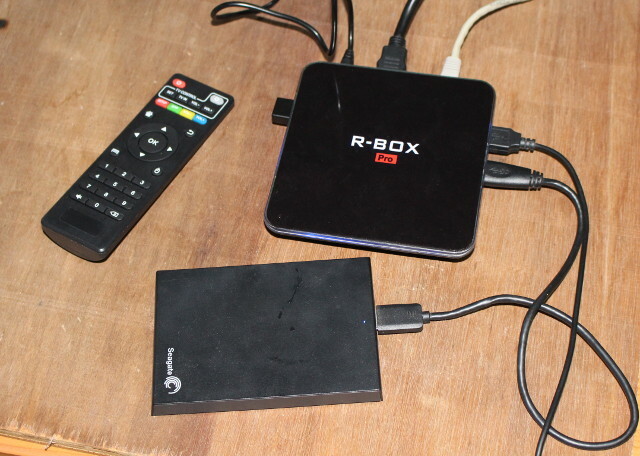 R-Box manufacturer releases different firmware with their 2GB and 3GB RAM version however. 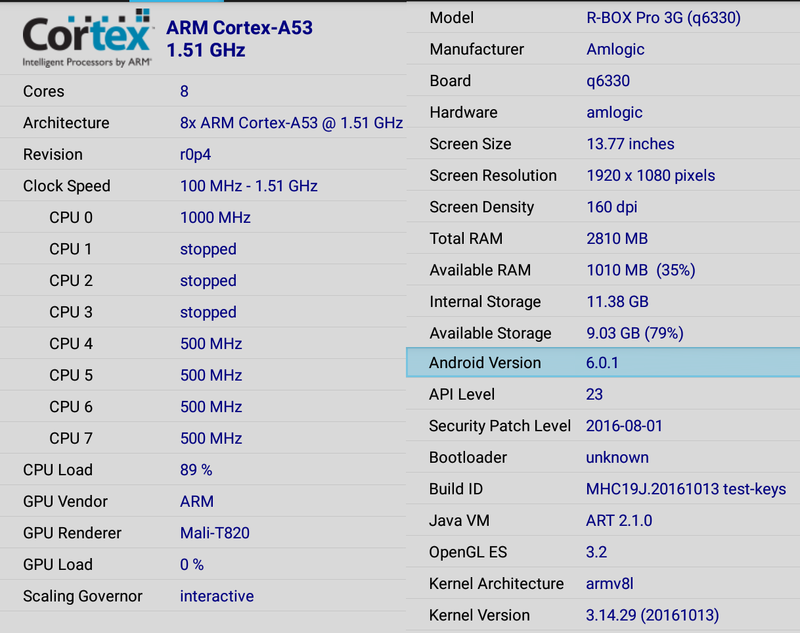 CPU-Z also reports Amlogic S912 is an octa-core Cortex A53 clocked at 1.51 GHz with a Mali-T820MP GPU. 3 GB RAM is detected, or more exactly 2810 MB taking into account the hardware buffers), with 11.38 GB storage available to the user. I ran Antutu 6.x to verify the performance, and 39,846 points is about what we’ve come to expect from Amlogic S912 TV boxes, with some devices getting as high as 42,000+ points. I was intrigued with R-Box Pro 3G because of its 3GB RAM, but I ended getting the worse Amlogic S912 TV box of the six models I’ve reviewed so far. OTA firmware is not working, the company does not seem to have a webpage for firmware, so I had to look on the Internet to find something on GeekBuying, with only IMG firmware requiring some Windows tools, or building your own parser in Linux in order to flash it. Clearly not user friendly. 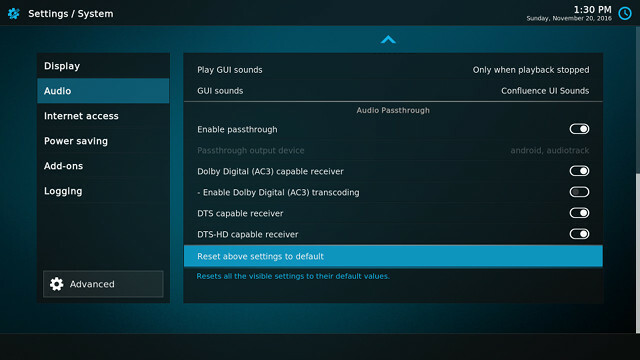 Kodi 17.0-alpha3 is installed in the box, and the list of issues is impressive: Vp9 videos can’t play, some 4K H.264 @ 30 fps video won’t play smoothly, automatic frame rate switching is not working either, and I only managed to get audio pass-through in Kodi work for a Dolby Digital 5.1 with some DTS-HD videos just showing a black screen. WiFi performance is rather weak both using 802.11n and 802.11ac WiFi, and the apps are not always loading very fast, leading the system to ask whether to wait or kill the apps. I’m pretty sure I missed some issues, but needless to say the company has a lot of work to do to make it a worthwhile device. Kingnovel provided R-Box Pro 3G for review, and resellers & distributors can contact the company via their website. Individuals should probably not buy the device at this stage, but you can still purchase it for about $70 and up on GeekBuying,and Aliexpress. Note that the 2GB RAM version is often sold side-by-side with the 3GB RAM version, and price starts at $66. Do you have the change log for this November 07 firmware? I have used aml_s912_q6330-R-BOX-PRO-3gddr-mac-20161015.img. It broke the Standby command as shown in this review “Standby – 6.4 watts”. I remembered the original firmware gave me <1 watt (my watt meter shows 0 watt, it does not show decimal number), the LED light can be turned off as well. … nope, no change log, sorry. I did see there’s also another dated the 27th. Do you have the link to the 27th firmware release page or the firmware download link? Thanks. … this one is dated the 27th. Hope it helps. Thanks, will try one of these. How can i download ??? … would you like me to upload to a mirror? Hey what I mean is that i do not get downloaded and does not have a username on the link and translated from china language. Do you have a direct link where I can download the latest software? You don’t need a username/password for baidu, just click on the download button “下載” at the top. Don’t look at the date in the url. It is a page with also the latest firmware dated 18 nov. 2016.
for me the untutu score went up with with 2000 points. Did not had the time yet to test further. Try a different web browser, I don’t see “下載” using Chrome and Firefox but Opera Android browser shows “下載” . Hi Kurt, Tried to download it three time, always failed at 29%. Is it the same .img file as http://www.mediafire.com/file/1qjwnd8areplxkt/PC.rar which is referred from http://blog.geekbuying.com/index.php/2016/09/27/r-box-pro-amlogic-s912-tv-box-firmware-20160927/? Thanks Kurt. I got your file downloaded successfully. When I did a hex compare with the un-rar-ed .img file from http://www.mediafire.com/file/1qjwnd8areplxkt/PC.rar , they have the same contents. When PC.rar is un-rar-ed, it gives the same file name as yours. I’ll upload the files to another host that’ll be easier for you to navigate. . Provided you use a PC to download the file, you can click on the icon reading “下載(533.6MB)” in the link provided by Shomari. The download should start within a few seconds, no login, no questions asked. then I downloaded just one pan.baidu exe program?? I’ll upload the other builds later.. Thanks Shomari this link from mega.nz works good to download from..
only q6330 3g software tested work on my R-BOX PRO 3gddr? Hey Jan -Ivar did you get the update up running ,i tryed but i got red x in the andriod when i try use the sdcardoption what did you used for Shomaris update ? Sdcard or USB A-A ? Same problem only q6330 3g software works ok. Same problem only s912 q6330 3g software works ok.
aml_s912_8723bs_yuenanTpS8(2016_12_03)mac.img from aml_s912_(2016_12_03)mac.rar is about 300 MB smaller than other R-Box Pro images. That is why I did not want to try it. … no problem; here’s the 11/07 dated firmware. Both firmware files are for CSA93 TV box, see https://www.youtube.com/watch?v=BPoJ8xrZad4 and https://www.aliexpress.com/store/product/CSA93-Amlogic-S912-Octa-Core-Android-6-0-TV-Box-RAM-3GB-ROM-32GB-2-4GHZ/1805266_32743367199.html. I think they have the same or similar q6330 motherboard. I have flashed the one in post #42 (which is the same as in post #3). The boot up logo is the same as in the first link Youtube video and it does not have the very loud sound. It is good for me because I don’t need to turn down the TV volume during boot up. There might be a screensaver enabled in the settings, try to disable it if possible. The photo for R-Box Pro board can be seen @ http://www.cnx-software.com/2016/10/01/review-of-r-box-pro-tv-box-with-3gb-ram-part-1-unboxing-and-teardown/. I’m not sure about H96 Pro+ board photos, but if you have one you could compare. Another way to get is using the board number via CPU-Z or other apps. For R-Box Pro it’s q6330. You also need to make sure the memory, storage, and WiFi module are the same to increase the probability that one firmware will work on another box. 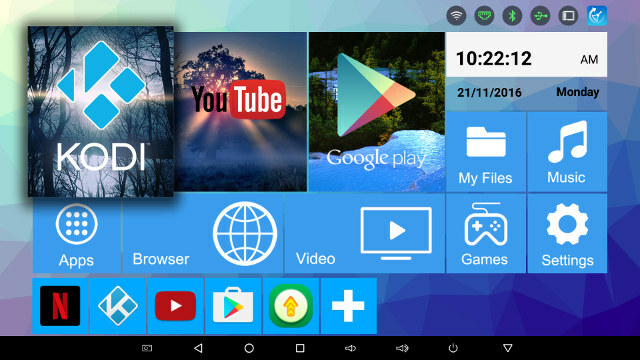 Have you tried Kodi coz only in Kodi i have problems with that image now im on the same image than you so im try to figger out whats wrong inside Kodi .Have you tried any benchmark ? I saw that people sell R-BOX PRO with android 7 does anyone has it? I have 2gb version. don’t get the r-box. The wifi barely works and the 2gb version will not stream very well.